No two people are exactly alike nor are their rosacea symptoms or reaction to rosacea treatments. On this point, results from our Pilot Study, as well our customers’ feedback, makes it clear that people’s response time to Rosadyn varies with the severity of their rosacea. In turn, we have had customers with mild rosacea elated after 2 weeks of using Rosadyn and those with more severe cases needing two to three months at an increased daily dose to ultimately break the chronic inflammatory cycle of rosacea. Even for those with mild rosacea, allowing time to halt the uncontrolled blood vessel growth responsible for facial redness (this is why Rosadyn includes potent angiogenesis inhibitors) and to repair the vascular walls of broken blood vessels is critical. Understandably, this process does not occur overnight. After all, most of us have had rosacea for years and we need time to repair that cumulative damage. 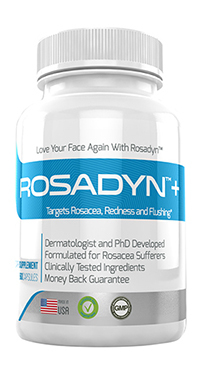 That said, feedback from hundreds of actual rosacea sufferers just like you gives us the utmost confidence that if you commit to regularly taking Rosadyn, you too can achieve dramatic results. 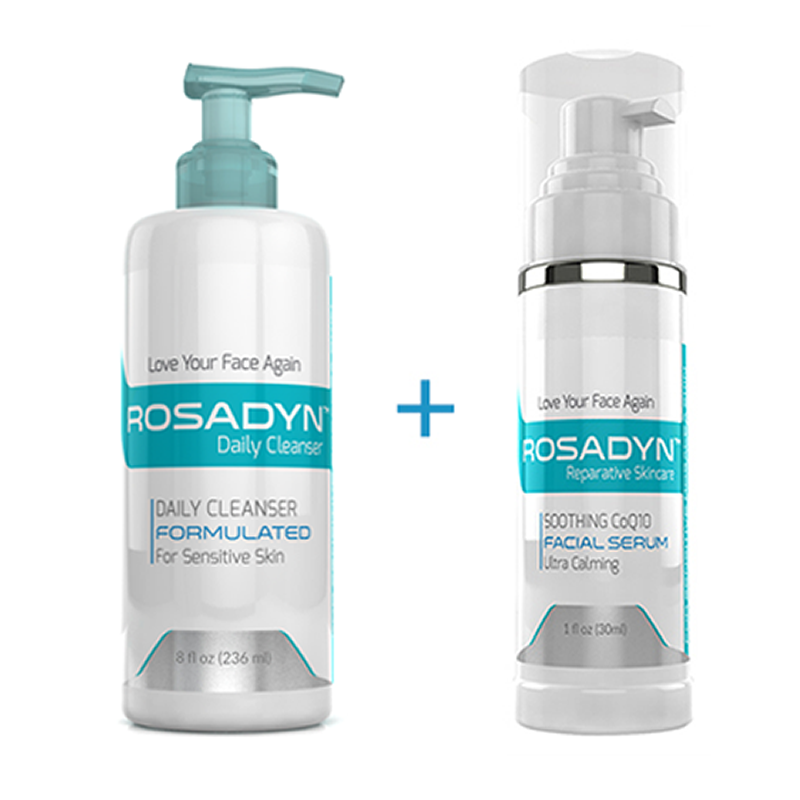 Because the time to achieve these results can vary significantly based on your starting point which also includes your general health, diet and lifestyle and level of rosacea, we offer a generous 6 month money back guarantee to give you ample time to allow Rosadyn to work. 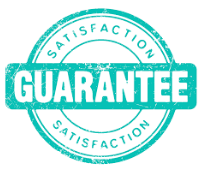 If you don’t see noticeable results and a reduction of your rosacea symptoms in that time frame, we will happily refund your purchase price, no questions asked! * If you are currently under a doctors care taking any prescription medications or have underlying health issues we recommend that you consult with a medical professional before adding any alternative supplements or treatments. 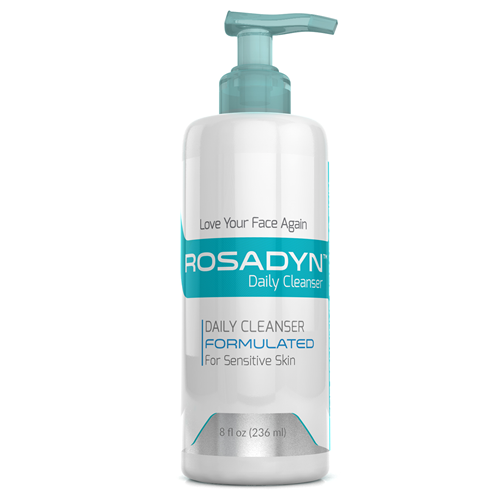 – How is Rosadyn different from other rosacea skin care products? 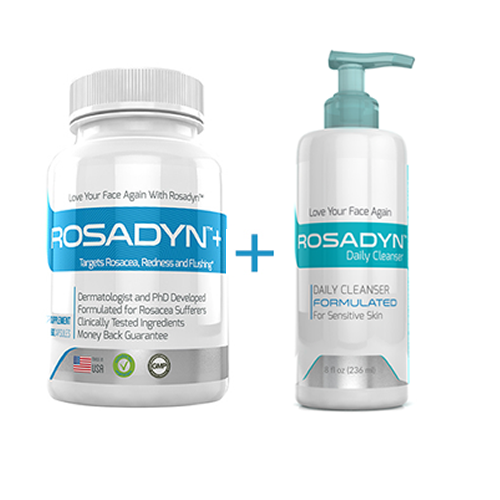 Rosadyn is the first oral nutraceutical on the market designed to address the root causes of Rosacea, not just the symptoms. As such, Rosadyn addresses all manifestations of the condition, including redness, flushing, inflammation, papules, ocular rosacea, swelling, and hypothalamic overdrive. – Is Rosadyn a rosacea cure? Currently, there are no available cures for rosacea. 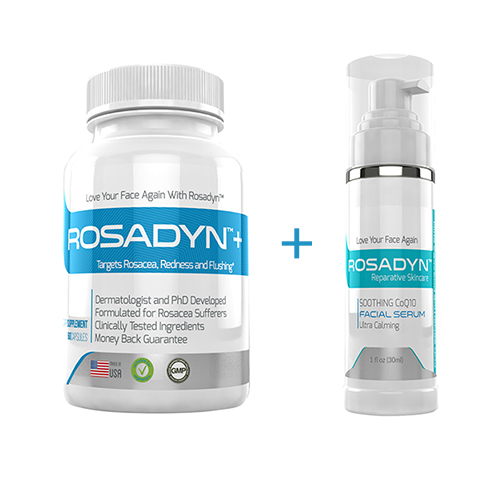 In the absence of a cure, Rosadyn was designed to target key symptomatic pathways throughout several layers of affected facial skin and support/reverse them to aid long-term reduction in rosacea symptom severity. – What type of rosacea symptoms respond to Rosadyn? 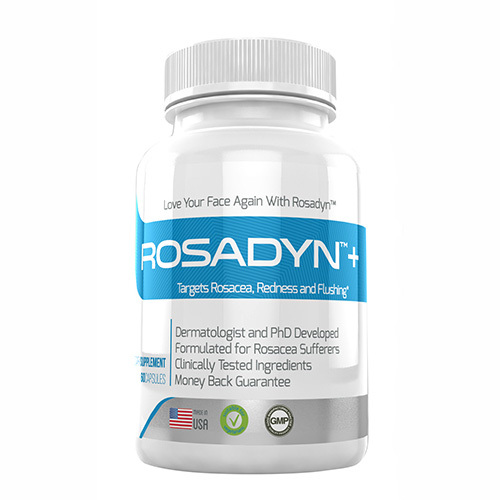 Rosadyn targets the redness, flushing and inflammation associated with rosacea. Skin changes that result in pustules and phymatous growth (skin thickening) may take longer to respond. We have also heard from our Rosadyn users that their ocular rosacea symptoms have also improved. – How long will it take to see results? Rosadyn is not a quick fix and takes commitment and time. When used as directed along with healthy lifestyle, rosacea friendly skin care, many rosacea sufferers will begin to notice symptom improvements within 3-5 weeks. However, some rosacea sufferers, because of the severity and advanced stage of their rosacea, may require more time and at a higher dose to begin to see improvement. Patience and consistent use is key! 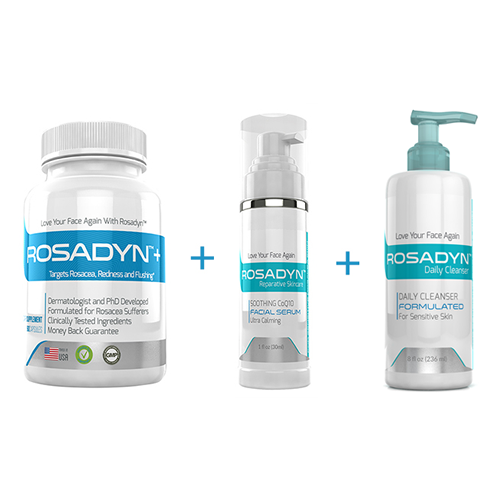 Remember Rosadyn is targeting the root cause of rosacea, not just the visible symptoms, and it takes time for your body to strengthen from the inside out. This is precisely why Rosadyn offers an unconditional No Risk, Money Back, 180-day guarantee, to give customers the full benefit of time to see improvement in their rosacea. – Will Rosadyn decrease my rosacea triggers? 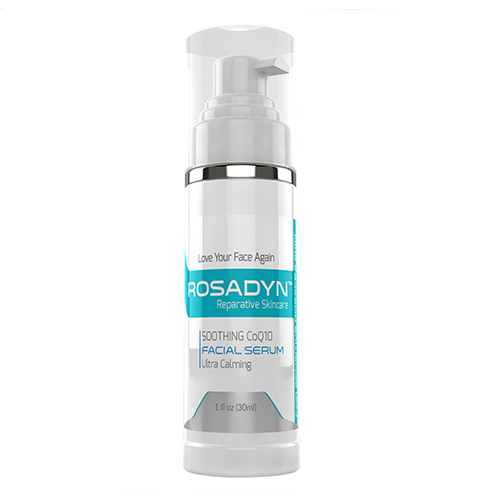 Rosadyn was designed to address the key symptomatic pathways throughout several layers of affected facial skin and support/reverse them to aid long-term clearance. As such, Rosadyn targets the key pathways through which rosacea triggers cause visible redness, flushing, and inflammation. – Will Rosadyn make me worse before I get better? While rosacea symptoms may vary from day-to-day and month-to-month, Rosadyn should not trigger a worsening of symptoms. There should be little-to-no adjustment or acclimation period. – Will taking larger doses of Rosadyn result in quicker results? Or, can I adjust my dose according to the severity of my rosacea? The active ingredients and concentration in each capsule have been chosen based on scientific and clinical studies. As such, Rosadyn users should begin with the recommended dose of two capsules per day for the first month. 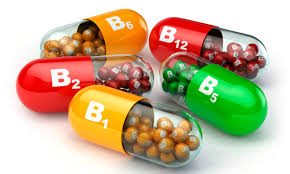 After a month of evaluation, dosage may be increased to three or four capsules per day. Do not exceed four pills per day. Please consult with your physician before altering your dosage. – Will I need to continue taking Rosadyn after I see symptom improvement? Visible symptoms represent only “the tip of the iceberg” for rosacea – the underlying cause of rosacea symptoms lie deep in the facial skin where they are not visible to the naked eye. As such, while superficial symptoms may improve during the first month of Rosadyn use, complete beneficial effects may require 2-3 months or longer. At this point, Rosadyn users can adjust their intake of Rosadyn to find the minimal daily dosage that maintains symptom improvement. – I cannot take oral medications or supplements without rosacea flares. Will this make me flare? No Rosadyn ingredient has been associated with triggering rosacea flares. Rosadyn was formulated to be gentle on the stomach and does not contain any known allergens. 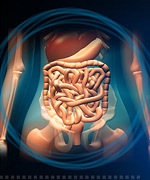 In fact, one of the primary ingredients in Rosadyn has been shown both scientifically and clinically to decrease inflammation associated with common gastrointestinal disturbances and was included in the formulation for this very reason. – Can I take prescription medications with Rosadyn? – How long does one bottle of Rosadyn last? 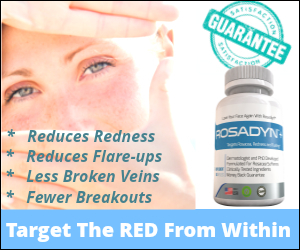 Each bottle of Rosadyn includes 60 capsules. 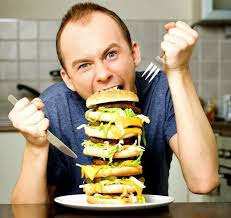 One capsule should be taken in the morning, with food, and a second in the evening, again with food. Therefore, one bottle of Rosadyn is the recommended dosage for 1-month of usage. 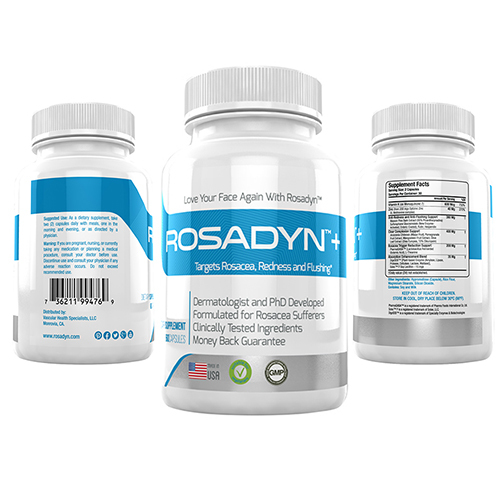 – Given that many of your testimonials state they take double to triple the amount indicated in order to see results, shouldn’t Rosadyn increase the strength in each capsule?? The reason why the supplements are at the ‘strength” they are is to cover a broad range of rosacea sufferers and their unique systems and stages of rosacea. With the broad spectrum of rosacea sufferers some are at beginning stages of rosacea and some are unfortunately in a further state of progression which require a higher dosage and more time to break the inflammatory rosacea cycle. Having a base level strength allows for rosadyn to adapt to the individuals needs and condition. You see, at the onset, dosage starts off slow to get the body used to the additional support and to gauge any possible reactions. Dosage than increases by slight increments with a wait for response scenario. If during any response period noticeable differences begin to occur with redness, flushing and swelling decreasing in intensity and frequency than this indicates that the body is responding to that dosage level with healing and the inflammatory response is beginning to be broken. At this stage many stay on this dosage for approximately 60 days to allow for healing to continue and stabilization of their rosacea symptoms and progression . At stabilization point many can then reduce back down the amount of rosadyn to a maintenance dose of rosadyn, which is the default strength. – I know that your pine bark extract product works well for people who have rosacea, however, because pine bark extract benefits skin overall health, I am wondering if it will do any good for acne.? Yes pine bark extract is a wonderful pharmaceutical for the skin, vascular and all over health but another active internal health ingredient is the Sulforaphane. Rosadyn’s Skin support blend also is a great skin health support. Even though specifically formulated to target rosacea flushing, redness and flare ups over all it is a great general health nutricutical. Many health conscious individuals actually buy many of the ingredients within our blends to take on a daily basis to a much greater expense than buying a bottle of Rosadyn ex: Sulforaphane, pine bark etc. are individually premium supplements. Regarding acne, like rosacea treating and managing its symptoms is not relegated to superficial treatments and requires a holistic approach. 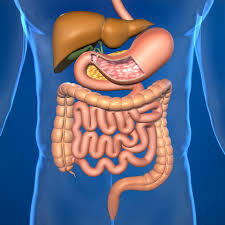 Meaning, diet, skin care internal health and if need be medical support working along side of each other. Basically your skin is a reflection of how your body is functioning from the inside out. 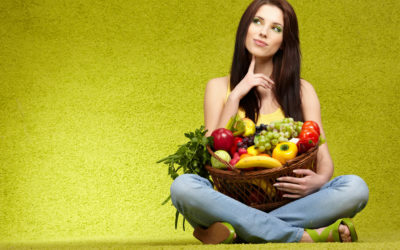 We have been seeing that “gut” health and foods you eat have a lot to do with not only rosacea but acne as well ( other factors can include hormones etc in acne’s case) You may find our articles on “rosacea diet & nutrition” a help if your suffering with acne. Inflammation is a big contributor to not only skin appearance but general all over health. They may help you with not only your general health but may also help you begin to help you help yourself by knowing how certain diets can effect your skin and all over health.